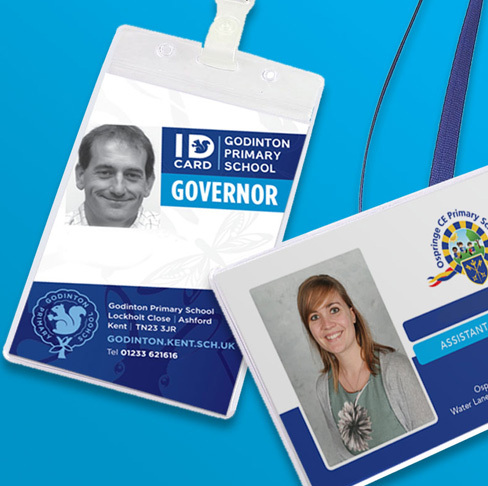 ID badges are critical in schools now and are a very affordable, low cost way of identifying staff, visitors and parents. Specially designed to your schools’ requirements, you can include photos, fire regulations, bespoke information for each member of staff. The choice is yours. These are printed on a rigid (credit card type) plastic, with a gloss laminate. Supplied with rounded corners, they look really professional. We can supply rigid card holders or clear plastic wallets together with coloured printed lanyards for STAFF, GOVERNOR and VISITOR along with others, but these are proving to be our most popular. From as few as 3 cards up to 100’s, we can accept exel files containing photos & information and merge data to save you any trouble. Proofed as PDF’s to you before printing begins. It really is a simple and easy solution to your ID problems.